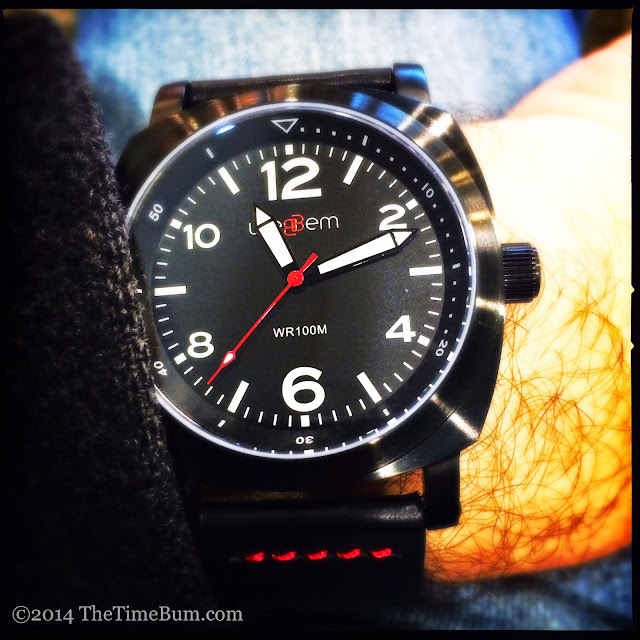 weBBem describes their products as adventure, survival, or military/field style watches. The Time Bum does not go on adventures. The last time I went camping was the summer of 1986, and frankly, 28 years has not been long enough. 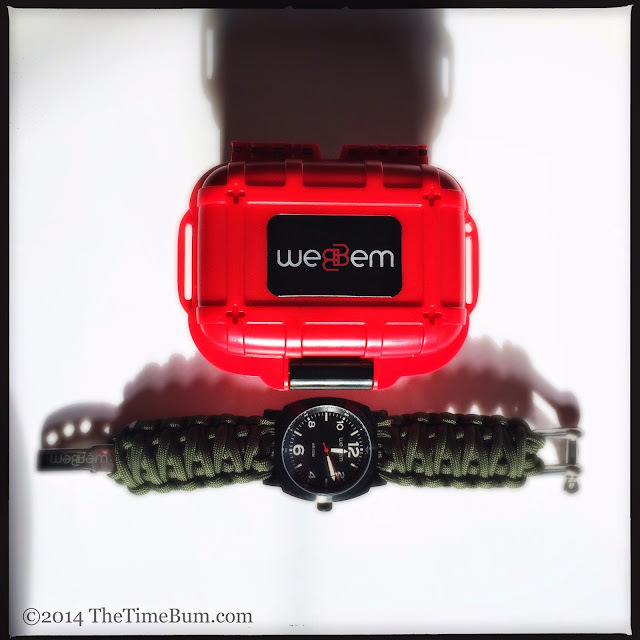 Still, I do enjoy the utility of a good field watch, and for $139, the weBBem Traveler offers all the right specs for outdoor activity: sapphire crystal, screw down crown, and 100 meters water resistance. 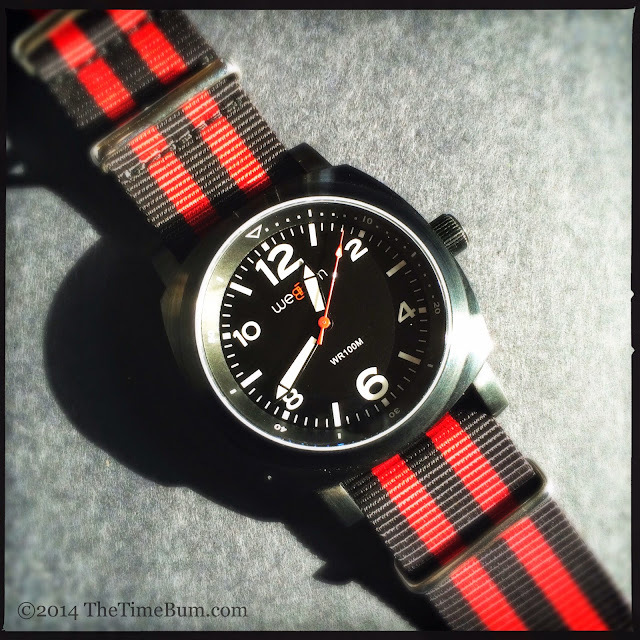 Buyers may opt for a black PVD coating, black or grey dials, and a choice of NATO or paracord straps. 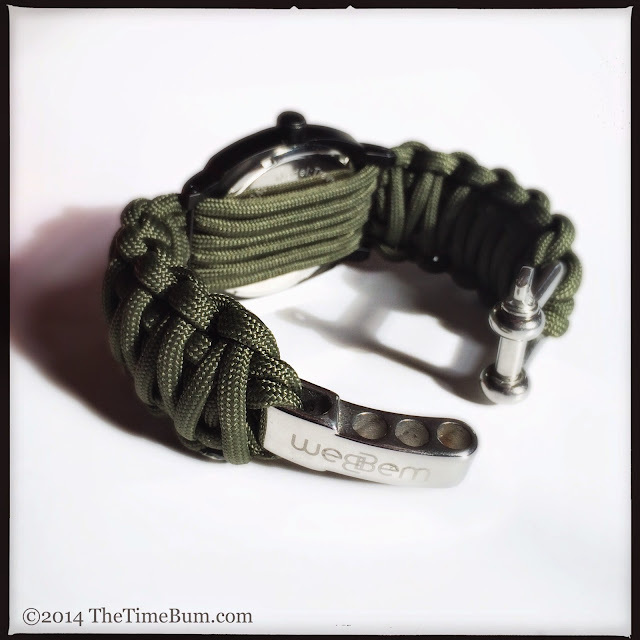 For this review, weBBem sent a black on black with both olive paracord and red/black nylon NATO. When I opened the bright red waterproof plastic storage box and saw the watch inside, I knew this was going to be a different kind of review. What I saw was not a watch with a funky strap, but a piece of survival gear that happened to have a watch attached to it. The watch head itself is quite conservative. The Traveler has a 43mm, 316L stainless steel, cushion shaped case with a brushed surface. The case is big, but not Panerai big. Overall length is 50mm and it is only 11mm thick, making for a very wearable piece. A signed, screw down crown at 3 o'clock contributes to its commendable 100 meters water resistance. The screw-in case back is also decorated with the weBBem logo. Inside, you will find a humble Miyota quartz. It's nothing fancy, but given the intended purpose of the watch, a sturdy and economical quartz unit makes perfect sense. It has a 3 year battery life and it should the job without fuss. The black dial uses a combination of Arabic numerals and rectangular markers, all lumed in white along with the hands. A bit of red in the second hand and the "BB" of the logo provides a spot of color. The chapter ring is marked in increments of five for the first third, ten thereafter. It is an uncluttered, workmanlike layout. 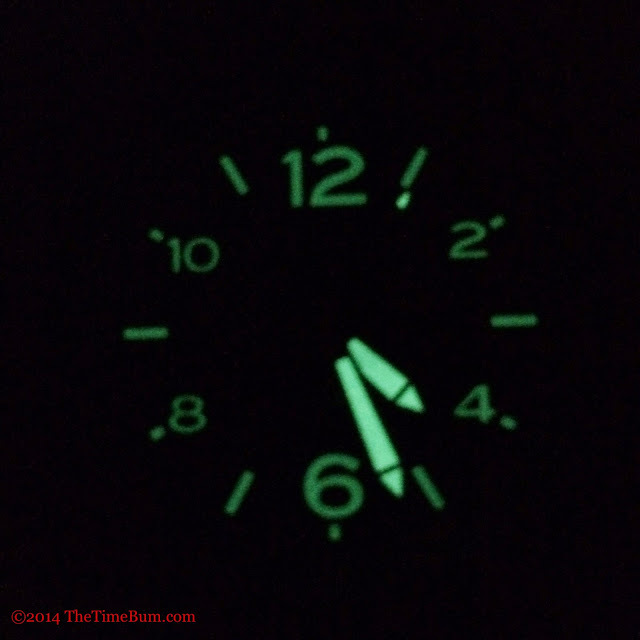 Night visibility is perfectly adequate, but you should not expect Seiko Monster levels of brightness. The lugs are short and drilled through to accept a sturdy bar that fastens with a tiny screw. The heads of the bar and screw are exposed on both ends. It's a solid attachment, but removing it requires two screwdrivers and carries the risk of scratching the watch. I managed to spare the case, but the coating did wear off where the screwdriver bit into the slot. I am torn on screw bars. They are a desirable feature, and I appreciate their security, but man, do I hate having to use two tools at once to accomplish an otherwise simple task. The lug ends accept a 24mm strap, which is a perfect proportion for this case. There is ample room between the bars and the case to fit a thick strap. The bracelet is the most distinctive feature of the weBBem. It is woven from a single length of paracord 550, an extremely strong synthetic rope that was originally developed for parachutes. Inside the outer sheath is a central core comprised of seven individual strands of polyester cable. The bracelets are sized for the buyer, so depending on your wrist circumference the strap will unwind into approximately 10 to 12 feet of cord. If you were to split the outer sheath and separate the core strands it would yield nearly 80 feet. In recent years, paracord has become immensely popular with all manner of outdoor sports enthusiasts, and bracelets woven from the stuff are now apparently a form of macho jewelry. Be they DIY creations or $500 boutique items, the idea is that your colorful accessory is really a coil of vital survival gear. The Internet lists dozens of uses for the stuff: clotheslines, shoelaces, tourniquets, snares, etc. 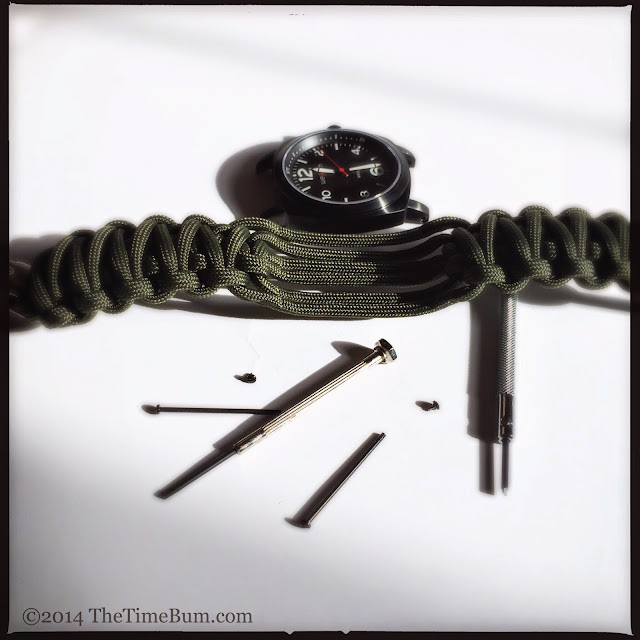 With a length of paracord, it seems you can MacGyver your way through any adventure. 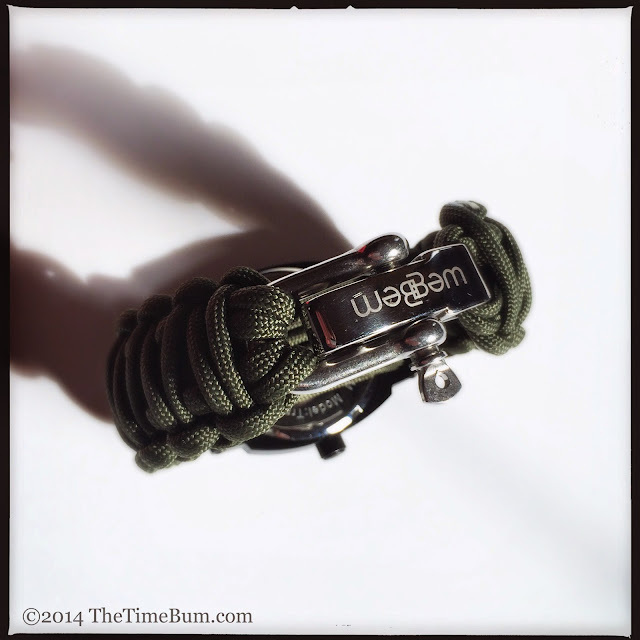 I admit, I am particularly unqualified to evaluate the paracord bracelet as a survival tool. On the other hand, I can give you the lowdown on how it functions as a watch bracelet. For starters, it is big - I mean BIG - on the wrist. When you order your paracord bracelet from webBBem, you provide your exact wrist measurement, so what you see in the photo below is not the result of poor fit. It is just that bulky. Only single strands are run under the watch head, but they are still sufficiently large to increase the total thickness of the watch on your wrist to 15mm. Suffice to say, this is not something you wear to lay low and blend in. The bracelet fastens with a signed steel tongue, drilled to accept a threaded bolt that passes through a U shaped collar on the other end. The whole arrangement is impressively over engineered and undeniably secure. Once the weBBem is on your wrist, it is not coming off by accident. 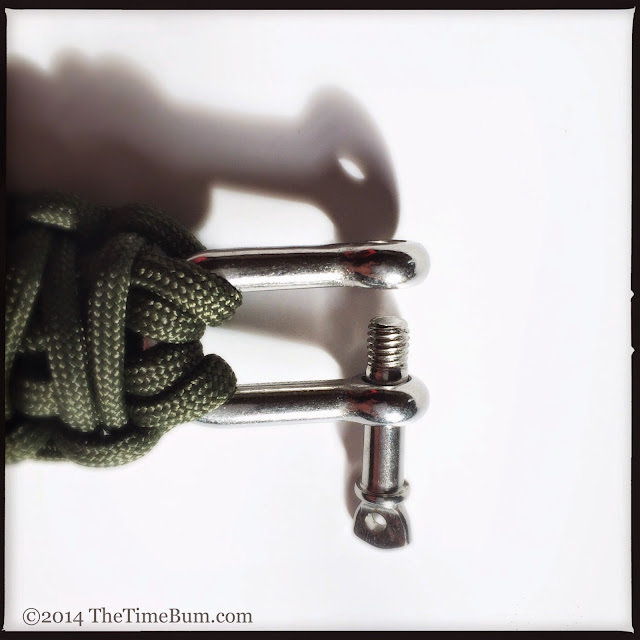 While the paracord sounded great in theory, I found it unwieldily in practice. It is just too darn fat. I might as well have worn a snow tire on my arm. Moreover, the Traveler is not a small watch, but it is dwarfed by the paracord. My advice? Keep your gear and your accessories separate. If you really need rope, buy a length of rope. If you want a friendship bracelet, make a friendship bracelet. If you want a watch strap, get a real watch strap. Fortunately, weBBem offers just the thing. The optional nylon NATO they provided was exactly right. It is weatherproof, secure, and it complements the proportions of the watch. My only issue was that it has polished hardware, not black or brushed like the watch cases, but this is a minor point. After a day or two on the NATO, I could not resist rummaging through the strap drawer to find another option. I came up with a two piece black leather with red stitching from Crown & Buckle that proved to be a perfect match. 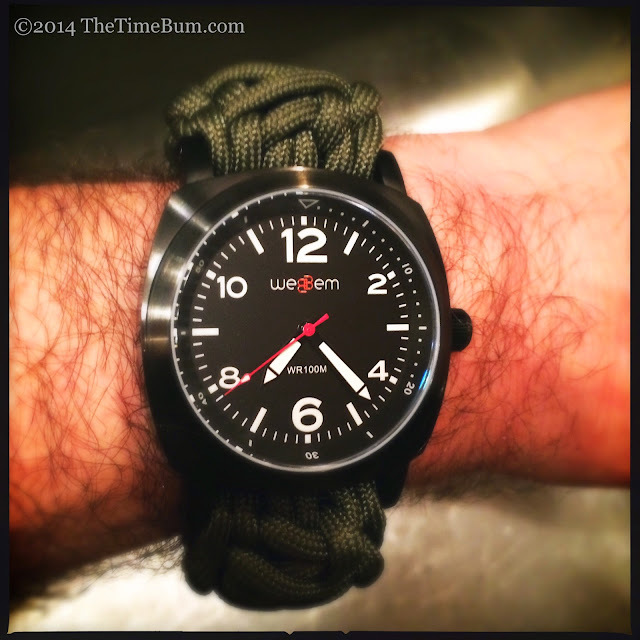 With the strap sorted, the weBBem Traveler became an easy favorite for the weekend. It looks great, has grab-it-and-go convenience, and with its sapphire crystal and 100 meter water resistance, I know I don't have to worry about it. 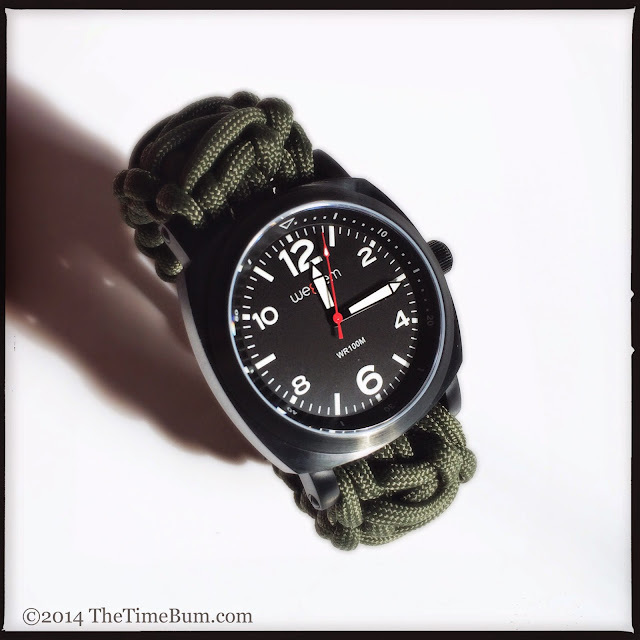 The $139 paracord model may not be for everyone, but the NATO will hit the sweet spot for many. It lists for $129 but they also happen to be on sale now for $119, which is a mighty nice deal indeed. Con: Paracord makes no sense to me. Sum: Great specs at a nice price. The Time Bum approves (but get the NATO).